The majority of the actor's two-million-plus Twitter followers agree: today's Daily News front page is illogical. 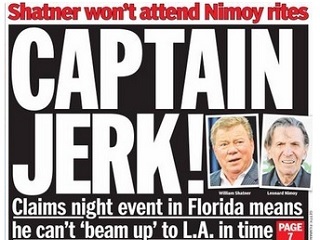 The Daily News cc:ed @WilliamShatner on Saturday when it tweeted out a preview of Sunday’s front page (pictured). This led to a call for discussion of the headline by Shatner and an active response from his followers. The headline is clearly an echo of a tradition relied upon even more regularly online; namely, drawing readers in with a sensationalized headline that does not accurately reflect the gist of the article. As Shatner tweeted, correctly, the NYDN piece by Kirthana Remisetti and Denis Slattery has a different tone. If the headline truly reflected the lede and beyond, it would have said something along the lines of: “Is Shatner a Captain Jerk for Skipping Spock’s Funeral?” But per Shatner and many others, that doesn’t move as many newspapers. Not Telling: Come on guys, Shatner’s 83 years old and on a different coast. Expecting him to take a flight out [of Florida] at 2 a.m. [to get to the 9 a.m. service] is probably not terribly fair. He doesn’t really owe anybody other than Nimoy’s family an explanation, but personally I’ll take him at his word that he feels terrible he can’t make it. P.S. Given how much the News is reportedly losing, maybe a different print strategy is in order.